Environmentally conscious, commercial grade reliability and maintenance free, these 6' and 8' traditional style recycled plastic park benches are a best seller for both indoor or outdoor public seating. 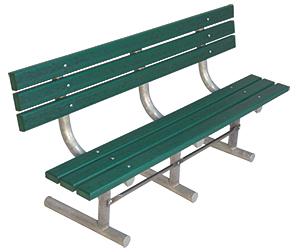 These sturdy park/sport benches feature a seat and backrest made utilizing recycled plastic materials, constructed with either 2" x 4" or 2" x 10" planks. The frames are constructed from 12-gauge, 2-3/8" O.D. pre-galvanized steel pipe shaped to produce with wrinkle free bends and MIG welded ensuring superior support and structural integrity—ready for high volume use. 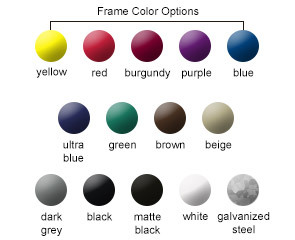 Frames comes standard with steel end caps and are available in configurations for portable use or permanent installations with either in-ground or surface mount specific footings.